I moved to Freehold, New Jersey, in 1969 at age 10. That summer we watched Armstrong and Aldrin walk on the surface of the Moon, and our family named our new kitten Apollo 11, or Polly for short. A few years later in middle school, I did a research project on the hydrogen economy, by which renewable sources of energy plus water would be turned into power for our utilities, homes, factories and cars. I was devouring books on human evolution and science fiction, National Geographic, Psychology Today, Omni, and Scientific American. I found it to be profound to dwell on the long sweep of history, on the origins of the universe, the galaxy, our solar system, our planet, life on Earth, humans, and civilization. As I also studied more science classes, especially biology, I came to find the theology of my Episcopal church upbringing to be in conflict with the science that I found much more compelling and meaningful. I felt a need to make a choice, and chose science over a belief in the supernatural. Having abandoned my parents’ faith, I tried to assemble a world view and a purpose to my life that made sense, that felt right. My favorite science fiction authors, Azimov and Heinlein, plus Star Trek, tended to focus on broad themes of expressing a vision for a hopeful future for humanity, in which we survive, and even thrive, for eons. I took this on, and determined that my life would be devoted to taking steps along a path that led to that positive outcome for humanity. In the mid 1970’s, it was not entirely clear that we were on that path. There was pollution, litter, the war in Vietnam, race relations problems, the Cold War, and political assassinations. We were losing entire industries, such as textiles and clothing. Springsteen’s My Hometown, which is about Freehold, captures some of that about the racial turmoil and factory closings. That abandoned textile mill loomed over the town, a massive brick structure with a hundred windows, most of which had been broken by stone-throwers. During my high school years of 73-77, the Arab states held the OPEC Oil Embargo, which on top of US oil production having peaked and declining, resulted in major fuel shortages, spiking prices, and nasty inflation. We also had a recession. Then, in the summer of 1976, I was at Ithaca College on a six-week program studying physics and chemistry, and an Ithaca physics professor told me about Gerard K. O’Neill, Princeton physics professor who wrote an article in Physics Today about space colonies. He had also written a book about it, The High Frontier, which I should read, and if I ended up attending Princeton I should look him up. I did all those things! Gerry O’Neill had a prestigious career in high energy physics. In 1956, as a Princeton instructor, (quote) “he published a letter in Physical Review entitled “Storage-Ring Synchrotron: Device for High-Energy Physics Research.” In two pages it laid down the path that high-energy physics has followed [since].” (ref. ssi.org). This led to a team from Princeton and Stanford to build the first high-energy colliding-beam experiment in 1965, which revealed the size of the electron. It being Fall of 1969, he chose the Apollo program as a unifying theme. As a supplement to the course, he formed an honors seminar for about 10 top students. He intended to pose a series of questions, but they found the first too engaging to let go of. It was simply this, “Is a planetary surface the right place for an expanding technological civilization?” They quickly decided against planetary surfaces, since at best that only enables a doubling of the population, which buys only a few decades of time. Together, Professor O’Neill and his students began designing free-space orbiting habitats. The basic idea is to take material from the shallow gravity wells of Earth’s Moon and the asteroids, process it into building materials like aluminum, glass, and steel, then build enormous rotating rings, spheres, or (most efficiently) cylinders. The rotation would produce artificial gravity that could be exactly the same as on Earth’s surface, or whatever we wanted it to be. Conditions could replicate ideal living conditions from Earth; for an example he would line the inner surface with Italian villages, but the point was that it can be whatever you want it to be. Because there is so much material available, and energy from the sun is essentially unlimited, we could build enough to add up to thousands of times the land surface of the earth, and every bit of it inhabitable and climate controlled. Over the next several years, he did more design work on his own. He also discussed it with colleagues. He tried to publish an article about it in a magazine, but went through several attempts without success. It took six years to finally get it published in Physics Today. This led to hundreds of letters from colleagues with questions, suggestions, and critiques, which he responded to in detail; an exhaustive peer review. He also organized a small conference at Princeton about space colonies, and arranged for a small grant from a foundation supported by the Whole Earth Catalog to route the money through the university, which led to a press release, which led to press coverage of the conference, which resulted in a front page article in the New York Times. This led to a very large media interest, interviews, etc. To answer the clamoring for a longer, more accessible explanation, he wrote The High Frontier, which featured a letter back home from colonists, vivid illustrations, and the rationale for expanding out into space in a big, meaningful way. An interest group formed itself around his ideas, named after the orbital location where he placed his colonies in The High Frontier, which was the fifth Lagrange point of the Earth Moon system, or L5. The L5 Society later merged with another space organization to form the National Space Society, which is still very active. Any L5 or NSS members here today? NASA was very interested in the ideas for a while, and funded O’Neill to build a device he invented to enable in expensive transport of lunar and asteroid material, called the Mass Driver. I worked in his Mass Driver lab, and if you google my name and ‘mass driver’ you’ll find the article I wrote about that. They also funded workshops and studies of his concepts. There is no shortage today of space visionaries. Elon Musk founded SpaceX with the goal of making humankind a multi-planet species. Robert Zubrin argues passionately and strongly for why to do this in The Case For Mars, and he started the Mars Society to enlist others in his advocacy. Buzz Aldrin, who we see regularly at space conferences, advocates the Mars Cycler, a sort of luxury spaceliner transiting between Earth and Mars every couple of years, using gravity assist maneuvers at each planet as its primary propulsion, and passengers just need to catch up to and hop on for the journey. Gerry’s original question, “Is a planetary surface the right place for an expanding technological civilization?,” can be answered by a mixed yes and no. There is value to having vibrant settlements on the surfaces of Mars, for all the reasons Zubrin and Musk provide. We can’t mine the Moon very well without some people being there, but perhaps more like being on a big oil derrick, visiting Antarctica, or a stint on the ISS; workers only, no families. However, in the long term, we will also want to fulfill the O’Neill vision of providing room to live for billions of people in the coming centuries. I see O’Neill’s initial question for his freshman class students as being a generous act of compassion for their challenges as science and engineering students on a 1969 college campus. It also reflects a concern with the fate and future of humankind as well as the Earth’s unique ecosystems. 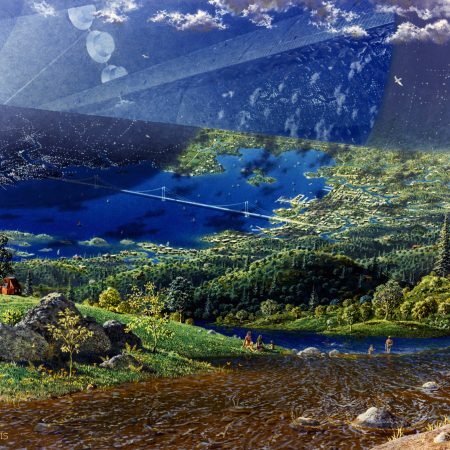 His solution of orbiting habitats accommodating an exponentially increasing human population would allow reducing the population pressure on the Earth, leading to increasing areas set aside as wildlife preserves and parks. Earth would receive tender loving care as our unique and incredibly valuable ancestral home. There can be plenty, wealth, security, optimism, and opportunity for every human being. I think each of us can contribute to a better tomorrow by living our own lives in an exemplary manner. A humanist perspective recognizes the value of each person, that they have much to contribute, and are worthy of prosperity. A home planet Earth with healthy ecosystems that can be sustained forever is critical to supporting a healthy and happy human population. The humanist and earth-centered traditions in the UU faith are well aligned with the O’Neill vision, in my opinion. Gerry O’Neill provided me hope and inspiration at a critical point in my life. I have watched with dismay as his ideas, once prominent, gradually disappeared from the NASA plans and priorities. Today, some enabling and motivating events have occurred. We have found water at the lunar poles, and in large quantities on Mars. We have major American corporations planning to extract and use that water to enable ease of movement. We have Elon Musk and Jeff Bezos with rocket companies, SpaceX and Blue Origins, making fully reusable launch vehicles and bringing the cost of space launch down. While Elon has his own space vision focused on Mars, it turns out that Jeff Bezos has a very different story. Jeff’s story is similar to mine, in that he was inspired by the High Frontier in high school, went to Princeton University, worked with Gerry O’Neill there, and is a believer in the O’Neill vision. I was present to hear him talk about this a month ago at the National Space Society’s annual International Space Development Conference, the direct descendent of O’Neill’s first space colony conference at Princeton. The next conference is a year from now in Alexandria, Virginia, and you can bet I’ll be there. I hope that each of you have in your heart a positive and hopeful vision of the future. I offer to you the O’Neill vision as part of that. May it bring you peace. Namaste.